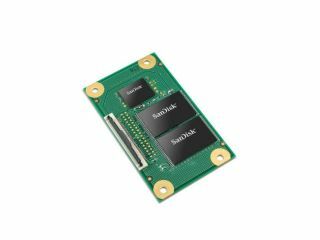 Designed to fit in the smallest and cheapest PCs and laptops, SanDisk has unveiled a new range of solid-state drives called PSSDs – standing for Parallel ATA Solid State drives. Available in 4GB, 8GB, and 16GB size, the SSD are just 3mm tall and weigh in almost 10 times less than your ordinary hard-disc drive. The drives have a streaming read speed of 39MB/s and a streaming write performance of 17MB/s and support both Linux and Windows XP operating systems. Although no official pricing or release date has been announced, expect to see the drives in ULPCs as of August. That is if you're the sort of person take your ULPC apart to look inside it.